I admit that when I started reading Dean Koontz, many years ago, I thought of him as a poor man’s Stephen King. You know, good filler in between the books I really wanted to read. But I soon discovered that Koontz has a distinctive voice, strengths where King has weaknesses (and vice versa) and more than enough interesting tales to tell to keep mainstream horror fans happy. I don’t read all his books, but stumbled on Innocence at the library and I’m not sad I checked it out. Innocence is the story of Addison Goodheart. Addison is a young man of 26 who has lived most of his life beneath New York City. For many years he shared his underground chambers, and life, with a man he called Father, but who was instead his savior in a world bent on harming him on sight. He travels the city only at night, never letting his face be seen by the world above. For, you see, the sight of Addison is so horrible, or terrifying, that it repels all who look upon him, driving them to violence. His underground father had the same affliction. He knows from experience that if he allows those above to look at him, they will very likely kill him. We meet him as he makes his way into the central library one night. He loves it there. And it – as well as many other public places – is accessible to him through knowledge and hardware passed on from those underground dwellers that came before him. This particular night he is startled by the presence of other people. To be specific, he is startled by a tall man chasing a young girl. The man is threatening her with physical violence and worse. But she is fleet of foot and manages to avoid capture. Once the man has gone, Addison Goodheart meets his first friend. Together they play a dangerous game of cat and mouse with those who can and will do them great harm if they are discovered. 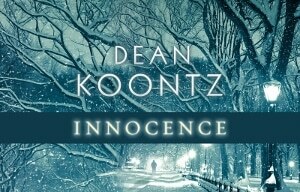 Innocence has a lot of the characteristics that make most Koontz books smooth and easy reading. He is a master of description, setting out scenes that are compelling, or terrifying, or mysterious, with the ease of someone who knows where his talents lie. Addison is a reasonably interesting character, as is the girl, Gwyneth. But they are definitely made more interesting by the settings into which they are placed. Without that framing narrative, they are rather repetitive and bland in word, thought and action. In truth, they – and all the characters – are rather thin. And their story, though compelling for the first two acts, ends up being rather cliché. Addison is portrayed as innocent to the point of being a virtual child. Gwyneth is supposed to be hardened and wise, but comes across at times as patronizing and insincere. Koontz builds their relationship on shaky ground and counts on his beautifully written city to fill in the blanks. And he more or less succeeds. I wanted to know what was going to happen to them. I wanted to know more about Addison’s terrible affliction. I wanted to see how they were going to deal with their obvious peril. I found his descriptions of Addison’s underground city, his excursions into the night, and his back story strong enough to overcome the weaknesses in the “present” story that the book was telling. I was disappointed in the end, but don’t let that discourage you from reading the book. It simply didn’t appeal to me personally – it isn’t badly written, badly resolved, or badly conceived. Overall, I’m going to give Innocence 3 stars out of 5. It’s a very readable book, with relatively appealing good guys, average bad guys, and a truly beautiful (and beautifully presented) setting. Thin characters, a few too many clichés, and an ending that didn’t float my personal boat keep it from a strong recommendation. But if you like Koontz, there’s no reason to think you won’t enjoy Innocence.